I have read this book in paper form but thought the audio book deserved a mention, as I only finished listening to it yesterday. I use Audible to download audio books and listen straight from my desktop whilst I work. I work from home a lot and find I can concentrate on both my work and a good book at the same time without being too distracted. I always try to download audio books read by the author where possible, as they are far superior in my opinion. Nobody understands the text quite like the author themselves and I find that you get the most soul from their readings. Neil Gaiman does indeed read my version of this audio book and , particularly as the book is apparently semi-autobiographical, he reads it perfectly. Gaiman reads the book as if he is a man half-remembering the events from his past, and still manages to 'do the voices' skilfully and subtly. Despite the fantastical elements of the story, it does not read like a fantasy novel at all, more a series of odd events, barely believed by the protagonist himself, happening in an otherwise 'normal' world. 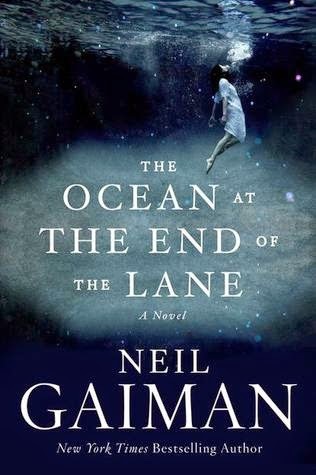 "The Ocean at the End of the Lane" is Gaiman's first 'proper' novel in a while, which resulted in me inhaling the paper version of the novel within a few hours of its release in desperation. My lack of self-control meant that re-visiting the novel as an audio book was a real treat, and I sank into the slightly familiar, but otherworldly, book with ease. If you want a synopsis, read the blurb. If you want to a book that you cant put down (or stop listening to) read this book. Read/Listen to this book if: you have liked any other Neil Gaiman book, you like escapism, you look back on your childhood with rose-tinted glasses, you grew up in what was the countryside (and now probably isn't), you want to forget about the real world for a few hours, you want to feel happily scared, you like fantasy routed within realism.